Wow! What a great time had by all! Our guide Claudia was passionate about her subject matter and really taught us so much about the Jewish Ghetto, the surrounding areas, the culture, and of course, the food! Make sure to go with an empty stomach...you will eat a lot of delicious food! We highly recommend this tour! What an amazing experience! I wish I had written down the guides name, as he was an absolute joy. He definitely went above and beyond during our tour. This tour is not to be missed, however, make sure to skip lunch, as you will never do justice to the food otherwise. Also, when stopping for tiramisu, I highly recommend the pistachio. Wear comfortable shoes and be prepared for an entertaining, informative, and delicious evening. I'm really glad I did this, after initially deciding to do no food tours there's so much there to choose from!. Seven courses not just bites and wine over four hours, and Georgio was an excellent guide, explaining what we were eating and drinking, and a pleasant host. We ate a wide variety of foods, which led to my trying some similar ones later in my trip. Don't miss the Jewish deep-fried artichokes! Another nearby restaurant has a 4-type artichoke plate that was my final meal in Rome! Roberto was an engaging, entertaining, educational and thoughtful tour guide through the Jewish Ghetto. His commentary on the various sites included historical and present-day observations. We got a layered and nuanced look at the district and Rome's complex history. He was patient, encouraged questions and has a great sense of humor. We didn't have to wait too long for the food and for some of us the first stop -- for friend artichokes -- was a key highlight. In fact, our party of four returned the next day to indulge in more of the artichoke treat and we encountered another group of four from our previous night's tour doing the same thing! 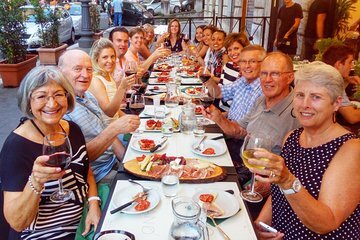 The choice of food and wine stops introduced us to a wide variety of Rome's specialties. After the artichokes, we sampled two varieties of pizza, a wide selection of antipasti, and then we headed to the pasta course in a charming spot with artifacts from early Rome incorporated into our dining room. By the end we were stuffed with history, great food and memories of a delightful evening in Rome. We highly recommend this tour! Lots of Fun! Recommended for everyone Foodie or not ! Our guide, Roberto, expertly combined history and stories with the walking tour of wonderful food stops. 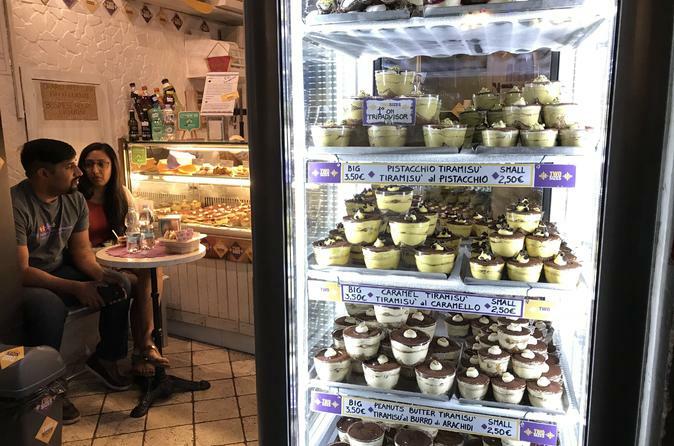 Eggplant Parmesan, tiramisu stop and Sant Eustachio coffee were standout treats. Walking pace and specific stops were flexible to fit the group. Bring a light jacket for an evening tour mid-May 2018. This was our favorite tour our entire trip to Italy. You must ask for Roberto. He was the best guide. The food is amazing-what you envision when you hear people talk about how spectacular Italian food is in Italy! This tour is a must. Worth every penny! Roberto is the absolute best guide we could have asked for! This is the second time we have done the food and wine tour . We meet like minded people from around the world, a guided tour of some of the not so often seen sights, fantastic nightlife, great local food and wine and good value for money. We can't recommend it highly enough. Excellent tour. We really enjoyed the food and our guide Roberto was great.